Sarah Watson from her window. Where? Here’s a great picture from Thesesa Marriott taken early this morning. Do you know where it is? THE A607 was blocked in both directions at Denton, this morning. due to a fallen tree. It has now been cleared. Many other roads in the Grantham area were only accessible with care due to snow. Mr Foster hasn’t been seen since leaving Grantham Hospital last Tuesday afternoon around 2.35pm after treatment for a fractured shoulder. The new photo shows him wearing what looks like a brown 3/4 length anorak type coat with a hood, a deer stalker hat, black trousers and brown shoes. He has very limited mobility and shuffles rather than walks and police say they are extremely concerned for his welfare as he has now been missing for four nights. Police are asking for anyone who thinks they may have seen Jack to contact them or anyone living in the north part of Grantham is asked to check outbuildings and sheds to see if anyone has stayed there. Any information should be called to 101. RAIN, sleet and snow is expected to spread eastwards towards Lincolnshire during Boxing Day evening before clearing overnight. Some uncertainty surrounds how much snow will occur, but several centimetres of snow is likely even at low levels, especially in a swathe through Wales and the Midlands, where there is the potential for an amber warning. As precipitation clears, roads could turn very icy. The public should be aware of the potential for disruption from snow. A depression will track southeastwards across England and Wales during Boxing Day, clearing southeast England overnight. A spell of snow is likely, even to lower levels, on the northern flank of this depression. South of the depression centre, rain will fall, heavy at times. Where snow does occur accumulations of 2 to 4 cm are likely even to lower levels, with more than 10 cm on high ground. There is the risk of 10-15 cm, even at low levels, parts of Wales and the Midlands being most at risk. Hello there. I’m wondering if this would be of local interest or you could advise me as to where I might find further information, I realise this is not Grantham related but it’s not too far distant. One of the prisoners listed is George W. Hand who’s wartime address was Morcott, near Uppingham, Rutland. George was a crew member of 434 Squadrons Halifax LL257 that was shot down 19/20 February 1944 on operations to Leipzig. George has two entries in the log book which I have attached to this e mail. 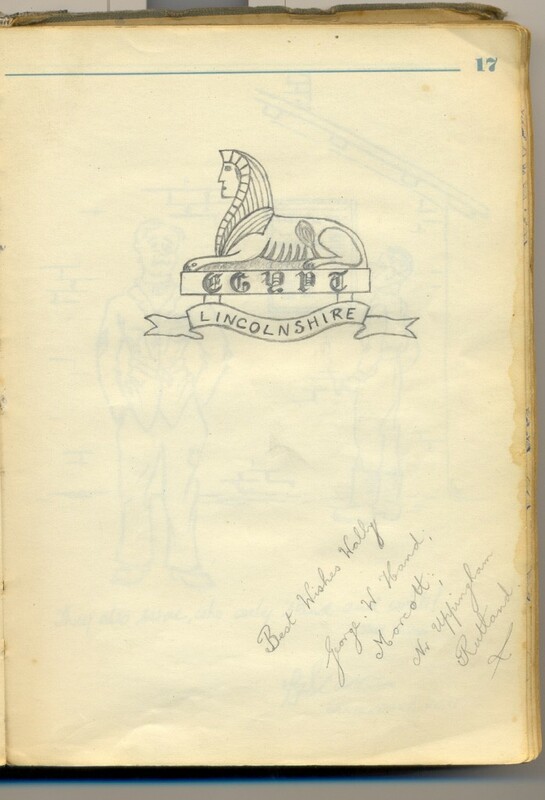 On page 17 there is a sketch by George of the cap badge of the “Lincolnshire Regiment.” An Army regiment that I believe George’s father John T. Hand served in during World War One. On page 25 is a list of prisoners who were part of George’s “Combine” at Stalag Luft VI and/or Stalag 357. George and seven other NCOs’ from his mess formed a combine for self preservation. They pooled all of their resources and as a group they would barter and scavenge for food and fuel and share the cooking responsibilities. Also listed is J. Seedhouse who gives his address as c/o Morton, Skillington, nr. Grantham. He is on page 87 of the log. Seedhouse was the Flight Engineer of 106 Squadrons Lancaster W4842 that crashed Leiden Holland with all crew becoming P.O.W.’s. 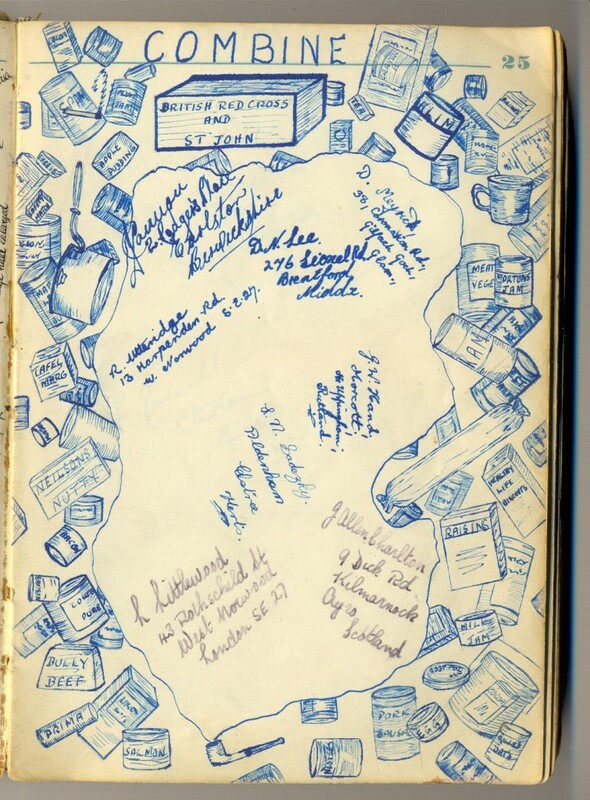 27/28 May 1943 operations to Essen. A BOOK recounting an aircraft tragedy of World War ll has added a colourful chapter to the district’s aviation heritage. ‘What Happened to You Lazy Lou’ is the previously untold story of a fatal mid-air collision near Grantham in 1944 that killed a much loved American pilot, six other combat decorated veterans – and the pilot’s dog, a canine forces pin-up. The story is highlighted within SKDC’s special Heritage of Flight web site, collated to commemorate the district’s rich wartime flying history (www.heritageofflight.co.uk) and the basis for the council’s ongoing aviation heritage programme to raise awareness and attract visitors. Aviation fan Dave Bristow has now published his book recounting the loss of the Lazy Lou Liberator aircraft that even inspired its own Airfix replica, co-inciding with the December anniversary of the collision. It tells the story of pilot Colonel Lewis ‘Freddy’ Frederick, promoted to 14th Squadron Commander that August and decorated with the Distinguished Flying Cross, the Air Medal with two Oak Leaf Clusters and the French Croix de Guerre. It traces the tale of his much-loved Dalmatian dog and regular flying companion, Major Jerry, who even had his own military number, a collection of press cuttings, his rank on his collar, own parachute and 1,200 flying hours to his name. Lazy Lou is also a story with a mystery. How could a routine training flight from RAF Barkston Heath go so wrong and was anyone to blame? It examines how the fates of 9th USAAF Troop Carrier crews and bomber pilots of the mighty 8th Air Force colluded to end in tragedy late morning on 18 December, 1944. One aircraft crashed immediately, killing all on board. The other, with Col Frederick in the pilot’s seat, almost reached Cranwell but broke up when it hit the ground. Frederick was killed and his dog badly burned when it ran back into the wreckage to find his master. He died six days later. Lazy Lou sole living crash survivor is 96-year old American instructor Ernie Haar, the hero of the hour. Climbing into the co-pilot seat, his flying skills acquired over 1,000 flying hours on the Liberator helped two fellow crewmen survive. He contributed to research from his Colorado home. Eyewitness Gordon Brown, then 14, recounts his memories of the collision. Grantham vet Denis Oliver treated the dog at Barkston Heath and has never forgotten the incident. Dave explained. “This incident was not mentioned in any of the crash site reference books and I felt strongly that the crews should be commemorated in some way. “It was the week before Christmas and they were thousands of miles from home. I imagined they would have breakfasted together, starting to believe the war was ending and that they would be back for coffee and doughnuts in an hour or so. “Last year aviation heritage sites across Lincolnshire attracted 124,000 visitors, benefitting the county economy by more than £4.2m. It’s incredible to realise just how big a role South Kesteven played in the major Allied airborne offensives of World War Two, and human stories like this really do bring it to life. ‘What Happened to You Lazy Lou” is available from WH Smith in Grantham, Amazon and the Barkston service station and sold 100 copies in the first week including to veterans the length and breadth of the USA. In the last month there has been an increase in the number of burglaries in the rural areas surrounding Grantham. At this time it appears that this trend has abated. I encourage everyone during this holiday period to maintain vigilance in your village community. Many of you will be away visiting friends or relatives, please ensure when leaving home it is secure and if possible ask a neighbour to keep an eye on your property. Thank you to everyone that has taken the time to contact their local policing team and pass on details of suspicious circumstances. It is not always apparent how this information is used but it is always of value, even if successfully ruling out the possibility that an offence occurred. FIREFIGHTERS from Grantham attended a house fire on Huntingtower Road, Grantham, at 3am this morning. Fire was out on arrival and crews administered oxygen to owner who was suffering smoke minor inhalation. Damage by fire and smoke to the kitchen. Fire caused by a cigarette. Whose car was burned out? A vehicle was found burned in a field off Church Street, Long Bennington, yesterday. Damage is so extensive, the vehicle cannot be identified.. Anyone with information on this incident please should contact the force control room 101 quoting incident 90 24/12/14. POLICE have issued a new appeal for people living in the area of north Grantham to check outbuildings and sheds for 83-year-old Derek Foster. Mr Foster left Grantham Hospital on Tuesday morning (23rd December) about 11.00am after treatment for a broken left shoulder. He was due to be taken home by taxi but has not been seen since he left hospital. He has very limited mobility and shuffles rather than walks. He was not using a walking stick when he left hospital. Ground searches will continue during Christmas Day but in the meantime, people living in the north of Grantham are asked to check their outbuildings and sheds for any sign that Mr Foster might have been there. POLICE are appealing for information about an 83-year-old man who hasn’t been seen since he left Grantham Hospital after treatment for a fractured shoulder, yesterday. Derek Foster left the hospital following an outpatient appointment and was supposed to go his home in Lilley Street, Long Bennington, but never arrived. When he left hospital he was wearing a dark brown overcoat, dark trousers and shoes. He is described as a white, with grey receding hair, glasses, slim build. He has a fractured left shoulder which means his left arm is incapacitated and cannot move it. Mr Foster is described as being ‘unstable’ on his feet. He was a distinctive gait due to his arm and his walk is described as a ‘shuffle’. A helicopter has been employed in the search for him. Police are appealing to anyone who may have seen Mr Foster in the Grantham area to contact them on 101 quoting incident number 392 of 23/12/2014. What were those noisy planes? Two deafening planes flew over Grantham just after 2pm appearing to be playing at a dogfight. Anyone know what they were? With two shopping days left to Christmas, Grantham is pretty chaotic. The roads are packed, the car parks full and you can hardly move in the supermarkets. Went to Morrisons and they were queuing down the aisles for the checkouts. Lincolnshire County Council has been given an extra £9m from central government to improve local roads and tackle potholes throughout the county. Councillor Richard Davies, Executive Councillor for Highways and Transportation, said: “The Department for Transport has announced additional funding of £5.8bn, over the next five years, to improve local roads across the UK . “Lincolnshire has received the largest amount of funding in the East Midlands, with just over £161m to renew, repair and extend the life of our roads. “This is welcome news for us, and this year’s extra funding, £9million, will increase our road maintenance budget significantly to just over £31m for 2015/16. This money will help us to repair potholes, which we prioritise by repairing the ones which aim to protect the greatest number of people first. Transport Secretary, Patrick McLoughlin, said: “Roads play a significant part in everyday life. Poorly maintained local roads, blighted by potholes, are a menace to all road users, particularly during the festive period as people travel to see family and friends. “It is vital we have good quality roads. This government has already taken strong action by spending £1 billion more on local roads maintenance than was spent in the previous parliament. “The £540 million I am announcing today for the East Midlands will put an end to short term fixes and will mean we have committed £10 billion between 2010 and 2021. THIS recent picture was taken by Paul Clark. But where is it?